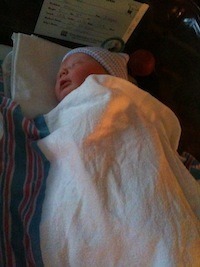 When a child is born, there is a feeling of unadulterated awe. If you are lucky enough to hold a baby that has just entered this world, you can scarce believe it. Here in tiny, fragile form is life overflowing with possibility. In those first moments the sky is the limit and you hope. You hope that child can dodge the mistakes that you have made. You hope the world will be a much better place after that child lives a full life here. It is a wonderful feeling. When that elation fades, your thoughts eventually turn to the flip side of the coin. What if you somehow screw it all up? What if that child makes the wrong choices? What if all this hope turns tragic? I cannot imagine the surreal heights at which Mary and Joseph experienced those emotions. All that hope and all that fear pinned to a miraculous child that was supposed to be the salvation of his people. Did they see him as a great leader? Did they worry that they might somehow thwart God’s plan? At the same time, I wonder about God. I don’t necessarily wonder if God thought those things about Jesus. The question of whether God is outside of time wrinkles my brain in this scenario. But I do wonder if God experienced that joy and sadness when he thought about us. The same day that Jesus was born in Bethlehem, a new way of life was born. It continues with everyone that follows that vulnerable baby boy. Surely God saw the great things that would come. The life of that child would transform scores of people. His life would move centuries of hearts towards love. Yet God also saw the horrible things that would be done in that child’s name. The bigotry, the hatred, and the slaughter. All the wonderful beauty that came in Christ would be undone in the eyes of some people because of the ugliness perpetuated by some claiming to follow Christ. Not that this filled God with fright like it would an earthly parent. I believe—I hope—that God saw that the pain and the plunder would be a footnote in the great story that was starting with His Son. Yet at the beginning there is that tension where things could go one way or another. It is difficult to move through Christmas and the coming new year without facing the start of all these stories. The wonderful thing is this time of year reminds us that a new start can be just around the corner. And so I thank God for the wonder that comes at the beginning. And I am thankful for the fright that causes me to hold more tightly to God lest I screw things up.